Sofia, Bulgaria: "I Can't Read a Sign"
Please click on the image for photos of Sofia, Bulgaria: "I Can't Read a Sign"
After two weeks in Romania I crossed the Danube into БЬЛГаРИЯ at РУСЕ. I can’t read a sign. The Bulgarians invented the Cyrillic alphabet, and like the Greeks, their neighbors to the south, they insist on maintaining their ancient culture. I had lunch at the Happy Bar and Grill where all the attractive waitresses wore short, I mean short mini-skirts. So much for ancient culture. I hired a driver to take me south to Veliko Târnovo. This “city of tsars” sits on several hillsides overlooking a beautiful river gorge. It's what you come to Europe to see. Ancient ruins, narrow streets with artisans selling their wares, medieval churches and monasteries. I spent two days just wandering and relaxing and climbing the hills of the Tsarevets Citadel. "The Tsarevets Citadel was sacked and burned by the Turks in 1393. This vast fortress offers great views at the top of the hill. Just below are the foundations of the extensive Royal Palace on three terraces. Twenty-two successive kings ruled Bulgaria from this palace. On a bluff above is Execution Rock, from which traitors were pushed into the Yantra River. From Veliko Târnovo I went west by bus to София. The central core of the capital city is quite charming - beautiful churches and municipal buildings in a variety of pastel colors. Even the cobblestones are golden pastel. Contrary to the opinion of the Romanians, the Bulgarians are friendly and helpful and in contrast to their reputation, quite slim and attractive and stylish. All the girls carry mobile phones and wear little black things. I rented a car for a day and took a trip east to a small well-preserved mountain town called Koprivshtitsa, known for its revolutionary heroes (Bulgaria and the surrounding areas were occupied by the Turks for about five hundred years). Then I drove east through The Balkan Mountains to Karlovo and south to Plovdiv with a Roman amphitheater still in use. I took the next day off and wandered around Sofia stopping at the Banya Bashi Mosque and the central, newly restored Sofia Synagogue. The synagogue is the third largest in Europe and seats 1300. The elderly man giving informal tours of the synagogue asked if I preferred my tour in German or Spanish. Hey, I'm from Miami. The synagogue is a splendid large building in Spanish-Moorish-Sephardic style with a huge chandelier and beautiful decoration. It reminded me of the Alhambra in Spain. Indeed, the central arch of the building is called the Cordoba arch. 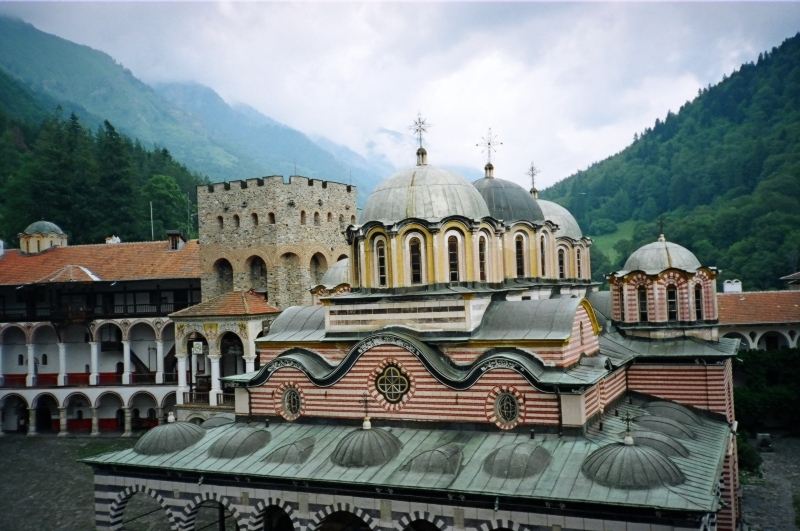 When I decided to leave Bulgaria I got that sinking, anxious feeling again. I finally figured out that my anxiety is brought on by leaving a place where I am feeling at home and going off into the unknown. And another new alphabet!